Paul McGuinness has decided to Walk On (sorry) after more than three decades as U2 manager. U2 HAVE CONFIRMED that Paul McGuinness, who managed the band for more than three decades, has officially stepped aside. McGuinness, long considered the fifth member of one of the most successful bands in the world, has sold his management company to live music behemoth Live Nation. Madonna’s manager Guy Oseary is now the new manager of U2 as of this week. However the band said McGuinness will remain their ‘mentor-in-chief’. “Paul has saved us from ourselves many times over and we would not be U2 without him,” the band said in a statement on its website last night. “Sometime soon, U2 will begin a new adventure around the world and we totally understand and respect Paul’s desire to not run away with the circus – AGAIN,” the statement reads. 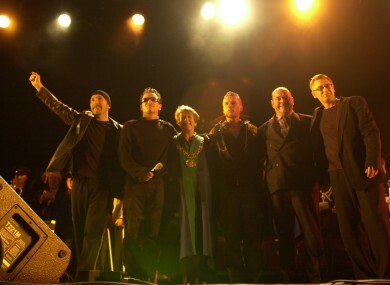 The band members praised McGuinness for his “extraordinary leadership, guidance and friendship over the last 35 years,” and said that his focus on the business of rock and roll had contributed to the band’s success. “Perhaps more than any music management operation in history, Paul… has always fought for our rights, for our music, for our fans and for the principles that we and he believe in,” the band said. “His central lesson was that if you cared for your “art”, you must also “take care of business” as historically with rock and roll bands, the latter has undone the former”. Bono, Edge, Adam Clayton and Larry Mullen Jr said new manager Guy Oseary will have some ‘big shoes to fill’. McGuinness is to take a more hands-off role as chairman of Principle Management, his former company. Email “U2 say goodbye to Paul McGuinness in typical U2 way”. Feedback on “U2 say goodbye to Paul McGuinness in typical U2 way”.